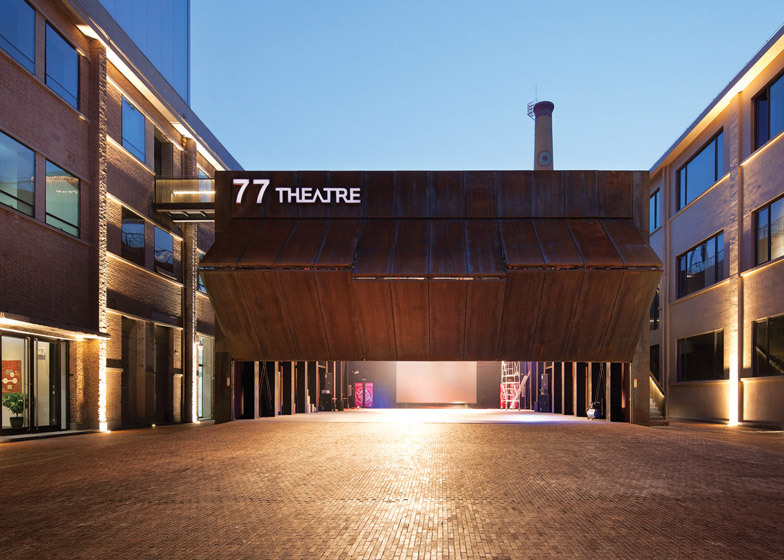 A huge folding wall lifts up to reveal the contents of a weathered steel auditorium at this abandoned printing factory in Beijing, which Chinese studio Origin Architect has converted into a theatre complex (+ slideshow). 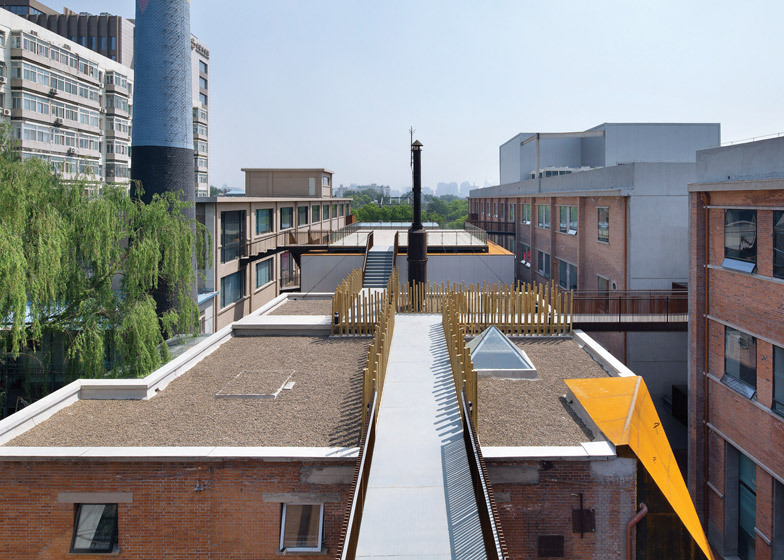 Built incrementally through the 1960s, 70s and 90s, the once-thriving Beijing Offset Printing Factory had changed from being a centre of industrial activity to a collection of desolate warehouses, hemmed in amongst the homes and alleyways of the city's hutongs. 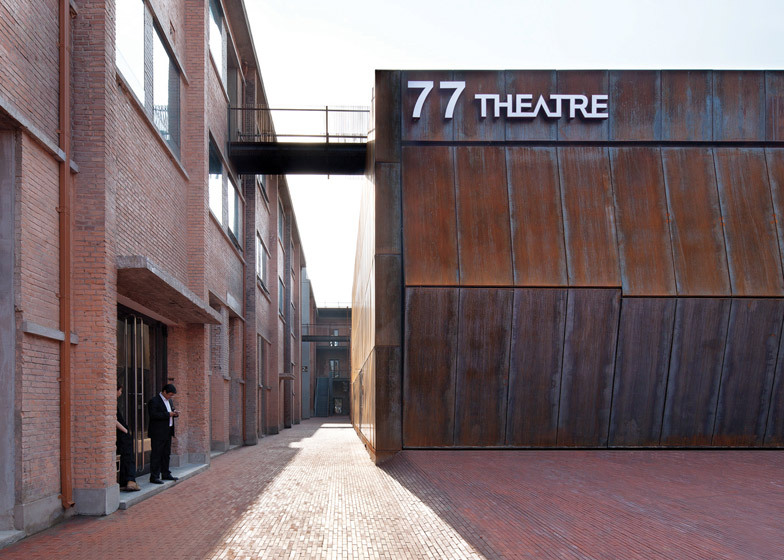 Following the successful reuse of buildings in the 798 art district and 751 D-Park elsewhere in the city, Origin Architect founder Li Ji was tasked with creating a new centre for art and culture, centred around a multi-purpose theatre. 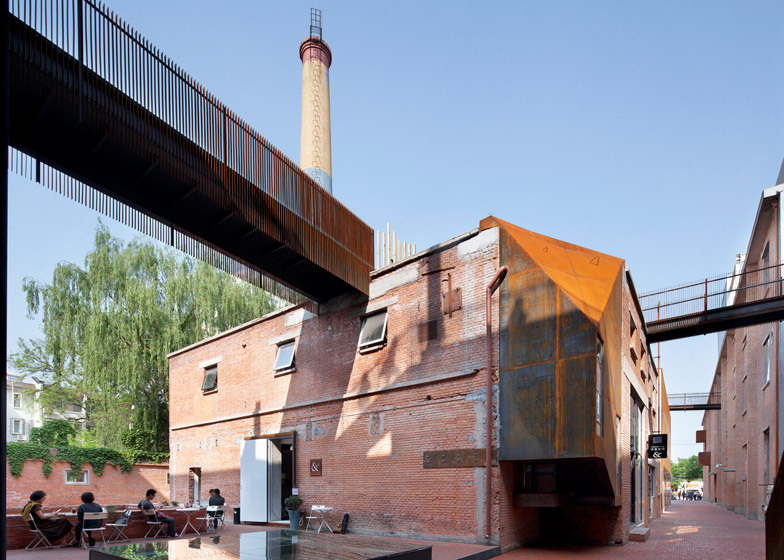 "Different from the grand factories of elite German descent in 798, Beijing Offset Printing Factory, nestled in the backstreet of an art gallery, is more like an industrialised courtyard with a scent of civil life in Beijing's hutongs," said Ji. "The hitting-point of the transformation strategy is to extend the accumulation of various industrial cultures, to awaken and arouse its inner vitality," he said. 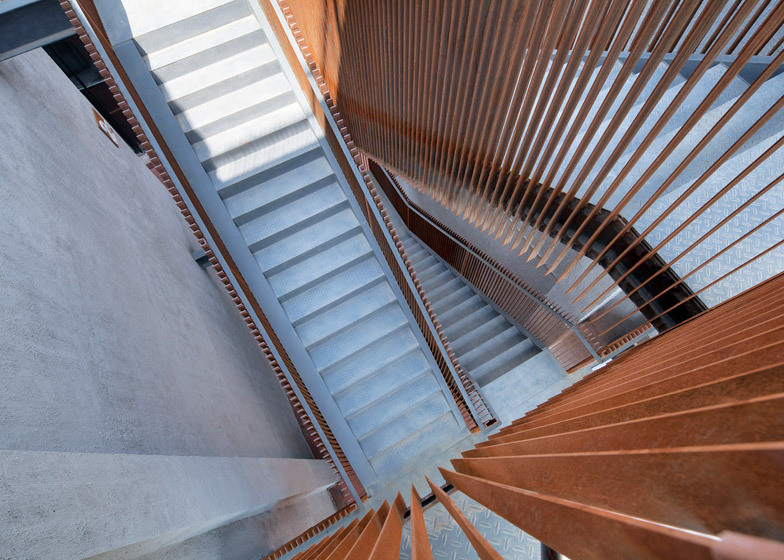 The architect began the renovation by removing a series of existing smaller buildings and extensions, freeing up space to create courtyards in the centre of the site. 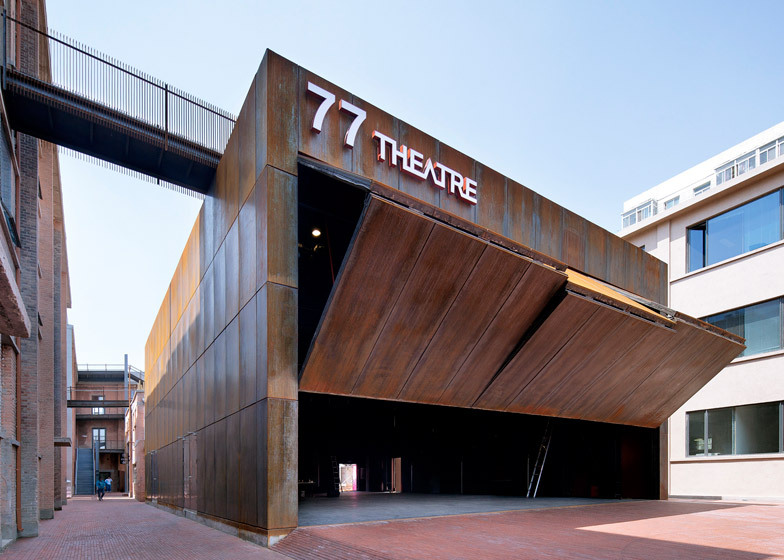 In the middle of these, a large warehouse with Corten steel walls provides the new theatre block. A folding wall makes up the entire facade of this building. 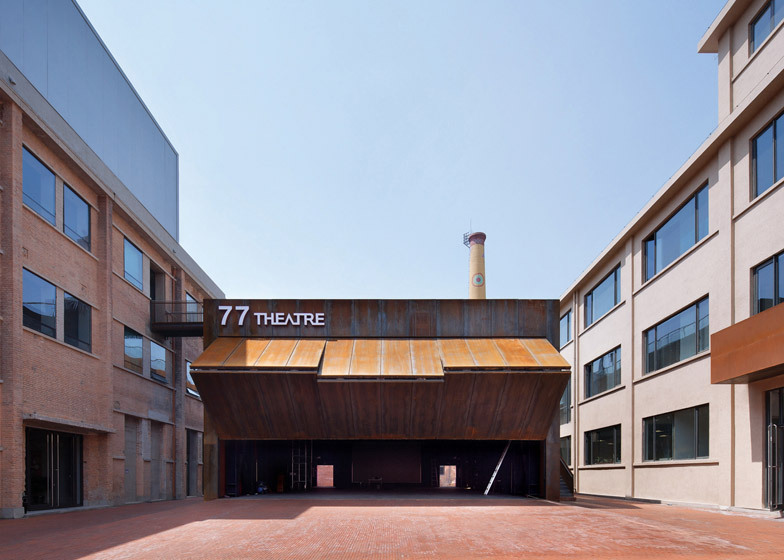 It allows the auditorium to be used as either an enclosed theatre or an outdoor performance space. "The front yard becomes an outdoor theatre without boundary," said Ji. The architect also removed layers of paint and plaster – accumulated over many years – from the facades of the old factories, exposing the original brickwork. The interiors were gutted, creating spaces that can be used as galleries or studios for artists. The project is completed by a series of new bridges and pathways that extend through walls and over rooftops to link different buildings. "Breaking through the shackles of original structures, a unique space travelling system is leading the free and stereoscopic flowing growth of the initial traditional yards and alleys," said the architect. Photography is by Xia Zhi. 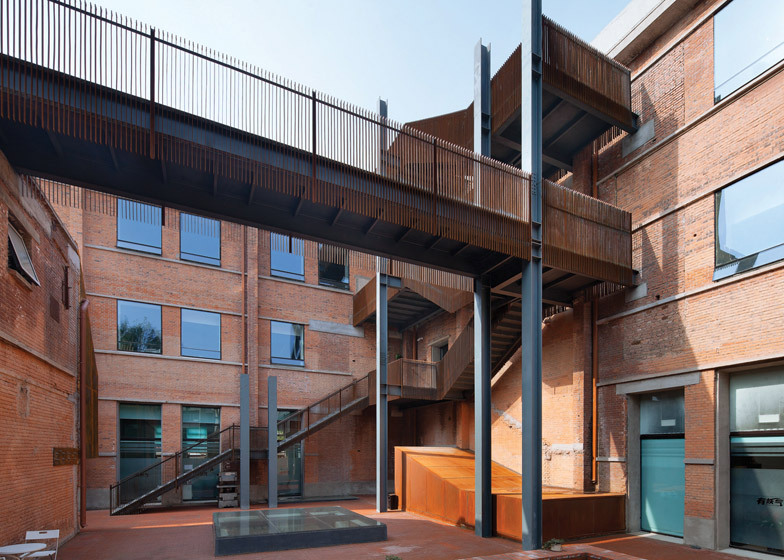 Different from the grand factories of elite German descent in 798, Beijing Offset Printing Factory, nestled in the backstreet of an art gallery, is more like an industrialised courtyard with a scent of civil life in Beijing's hutongs. Built in 1960s, 1970s and 1990s respectively, the industrial buildings have different histories. They look nothing special except the higher storey height. But once upon a time, there was a secluded yard boxed in the enclosures. Unfortunately during half century of trials and hardships, the original industries declined and shut down one after another; the factories were also dilapidated day by day almost beyond all recognition. The pipe lines are now ageing and bare; the idle workshops are separated and rent disorderly. The unordered addition jams the whole factory area and makes it a genuine warren. The integral reformation combining drama culture and functional replacement is in the hope of bringing a new vitality to the waste urban body. 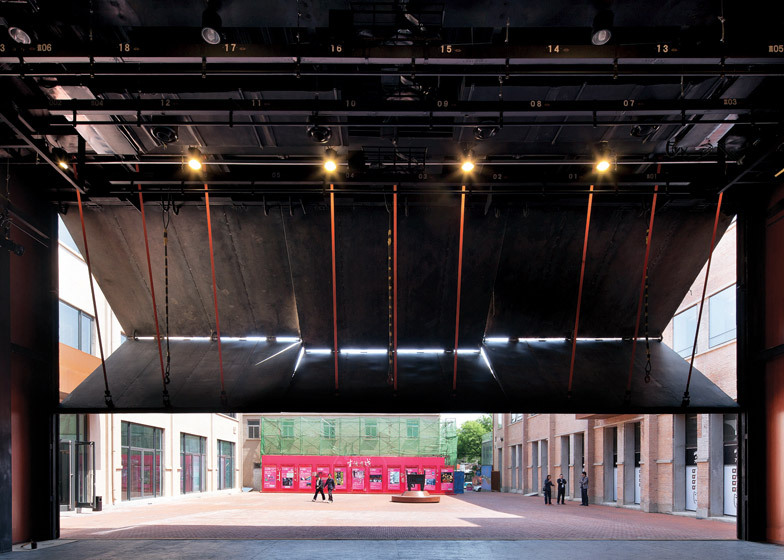 Respecting for the specific historical emotions of the courtyard, the hitting-point of the transformation strategy is to extend the accumulation of various industrial cultures, awake and arouse its inner vitality. Starting with targeted local excision, the addition part which causes the overall blocking will be cleared: in the east, eliminate the unauthorised temporary buildings and remove the disorder parking to make room for a quiet front yard; in the west, demolish the crude tin room attached between the two major structures to form a backyard; further clean up the blocked hutongs on both sides and link them up from back to front, thus a multi-layered courtyard space and alleys will be brought to light again. Breaking through the shackles of original structures, a unique space travelling system is leading the free and stereoscopic flowing growth of the initial traditional yards and alleys: some climb up circuitously from the ground courtyard to the roof garden; some fly crosswise from one house to another to form an air corridor; some straightly break into the room or underground and bring the sunshine, the air and the refreshing nature inside. There will not be only route any more. Traffic moving lines will evolve into irregular three-dimensional garden trails, which brought along interaction between indoor and outdoor space and scenery. The unreachable and isolated inactive roofs in the factory are totally activated by the verandas and becoming well-proportioned floating hanging gardens. The different heights, landscape experiences and arrival patterns of each garden form a flow of scenery in the stereoscopic alleys. Making up the shortfall of the limited ground space, the hanging gardens everywhere provide opportunity of closing to the nature for every internal unit. Moreover, the communication place for relax and encounter will bring creative inspirations. After breaking the rigid space, the diversity of environmental settlement will grow into the most suitable place for the ecological development of cultural creativity. Most of the plants were initiated in the early 1970s. After repeated temporary renewal paintings, the true features of the walls had been covered layer upon layer. Now being polished layer by layer, the decorative cover is carefully removed. Thus the buried historical truth is able to come to light again. Built in the Cultural Revolution period, the brick walls are now exposed with their uneven texture and coarse construction. Meanwhile the flavour and memory of the special times are transmitted frankly. Although not very perfect, the antiques have it all over the fake decorated forgeries and deserve respects for their dignity. On the old walls, a series of interventions are exposed deliberately without any dissimulation in people's sight. Being renovated with different techniques, some holes have sharp cutting marks and others are rough and unfinished with the remaining trail of chisels. 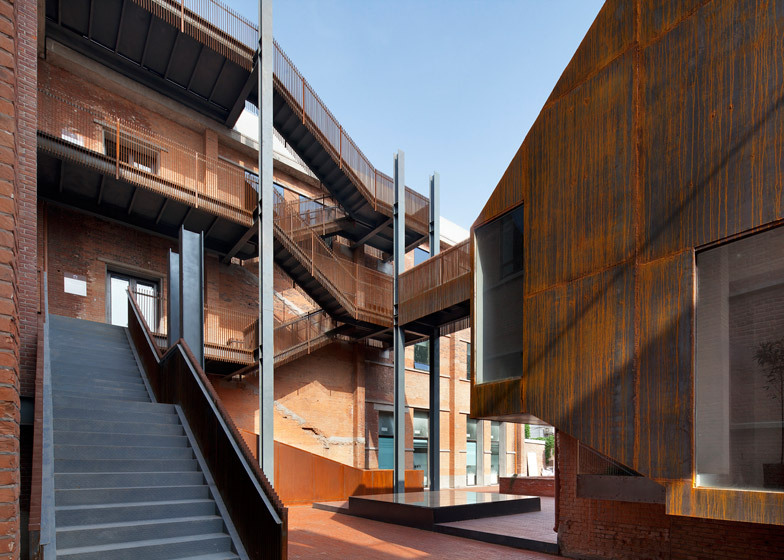 Old brick walls of different ages with scrapes and marks, reinforced concrete walls processed by clinging and casting, embedded steel beams, simple and clean glasses, all these crafts and materials of different eras are distinctively combined together. Just like the steel nails used in staple china art, the new and old are combined to manifest the change of times. Contrary to the current architectural concept which is becoming finer day by day, materials and techniques with low precision and more direct construction methods are adopted during the renovation. Preserving the original shape and specification of steels, removing all unnecessary processes and decorations, the integrality and independence of every piece of material can be protected. The joint constructions are made as simple and direct as possible to reveal the beauty of power and essence. The weathering steel, naturally mottled and rusted as time goes on, is now talking with the surrounding old brick walls in a whisper. The new buildings have become integrated with the overall historical atmosphere. Therefore the deep industrial temperament of the factory can be further strengthened with its cohesion power. If the veranda system can be considered as the artery of the garden, then the warehouse theatre is the garden's heart, the fountain of vitality and charm. 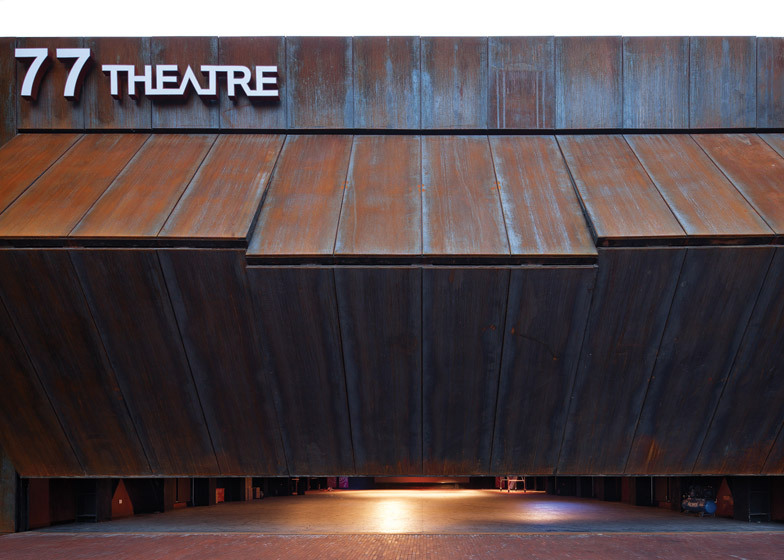 The theatre is newly constructed on the former address of dilapidated buildings. 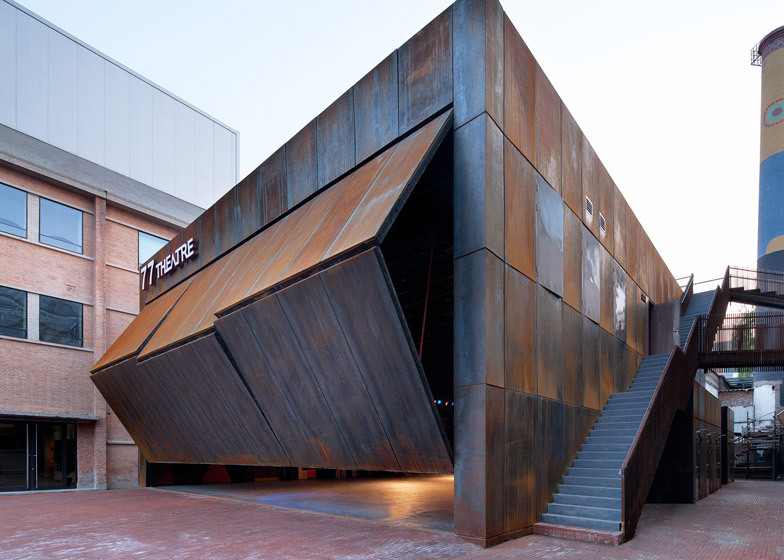 Adopting the architectural structure of industrial warehouse, massive I-column steel and Corten steel panel, the massive industrial space of the warehouse strongly contrasts the fashion and living drama scenes. 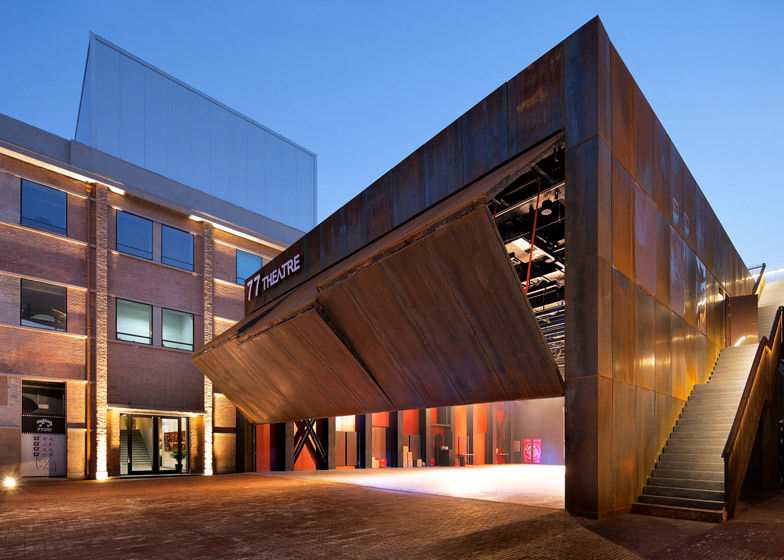 When the night falls, when a shocking scene opens, the warehouse theatre walls toward the courtyard will be hung up slowly with the internal lighting and popularity gushed out. The drama and cultural life are no longer limited in a fixed space. Vitality is spreading everywhere in the garden. The front yard becomes an outdoor theatre without boundary; the alleys become joint channels; the roofs and verandas are changed to air stages and stands; the terraces on the old brick houses become boxes. The gap between actors and audiences is eliminated; the estrangement between culture and life is vanishing. The whole garden becomes an omnipresent open theatre and then integrated with the comprehensive city life. Client: Beijing Dongfangdaopu Culture Assets operation management Co. Ltd.